Close your eyes and imagine life in our fair city over one hundred years ago. Imagine it was a week like we’ve had, a scorching heat wave, in your restrictive starched collar or corset – and there is no relief in sight, no air conditioned buildings to dart in. Sweat is dripping down the back of your neck, the small of your back. You need something refreshing. Now. I think we can all get excited about that this month! So let’s explore the background of DC’s historical cooler, find out who the contestants are, and learn what makes a classic Rickey so special. Full disclosure – I’m honored to be one of the judges this year, joining Ana Maria Cox of GQ, Jim Hewes of the Round Robin Bar at the Willard, Tad Carducci of Tippling Bros., and Peter Smith of PS7’s. So in the interest of impartiality, this will be the last you hear from me personally on the contest until my round-up afterwards. To kick-off my participation, I went to the Columbia Room’s seminar led by the world authority on the Rickey, Derek Brown. Derek is passionate about DC’s own cocktail (he’s even the author of the Wikipedia page on the Rickey) and it’s hard not to get swept up in that passion as well – the story he told has everything we love about Washington, even a dive bar. Shoomaker’s was a famous watering hole at 1331 E Street – before you go looking for it, like many Belle Epoque sites it no longer exists, but that’s roughly next to the National Theatre where the Marriott Hotel is now. Major Shoomaker reportedly could drink an entire bottle of champagne in one gulp (that must’ve been a helluva burp), and the bar was nicknamed “Cobweb Hall” because of his superstition against cleaning. This was the hangout for Washington politicos, lobbyists, journalists, and all sorts of characters. Working the bar at Shoomaker’s was George Williamson, the “king of julep makers” and a true gentleman, and bellying up was Colonel Joe Rickey, a Democratic lobbyist, gambler, and brawler (you know, the way politicians used to be). The precise genesis of the Rickey is clouded in the usual mystery, but at some point Williamson added half a lime to the Colonel’s morning restitution of bourbon and sparkling mineral water, and the Rickey was born. The lime could’ve come from a visitor to Shoomaker’s who picked it up at the Central Market. At some point gin was substituted for the base spirit, and the drink took off in popularity. In the end, Williamson’s role in the creation was overshadowed by the gambling Colonel, who ended up hounded by his namesake to the point of committing suicide. If you want to dig deeper into the story, ask Derek for more details, but be prepared to get swept up and become obsessed yourself! The drink itself is deceptively simple. The original Bourbon Rickey (circa 1883) consists of 2 ounces of bourbon, half a squeezed Key lime (since they are so small, a whole is also acceptable), and sparkling mineral water with ice. The Gin Rickey (circa 1893) substitutes 2 ounces of gin and half a squeezed Persian lime. In both cases it’s crucial that the lime shell is dropped into the glass once the juice is extracted. Like all drinks with simple ingredients, the quality of each element becomes of paramount importance. Derek explained that Old Tom style gin is best for the Gin Rickey, as its slight sweetness and intense botanicals cut what might otherwise be too dry. The original sparkling mineral water used for both styles was Apollinaris, with its higher salinity. Variations on the Rickey are almost as old as the originals themselves. Derek had us sample Bliz’s Royal Rickey (circa 1917), which added sweet vermouth and grenadine syrup, topped off with a very gingery ginger ale. For the Rickey Month contest itself, the drinks “re-imagining” the classic must maintain some of the historical accuracy – they have to be highballs on ice, have appropriate citrus, and must be refreshing. A little sugar is ok, but it must be balanced. 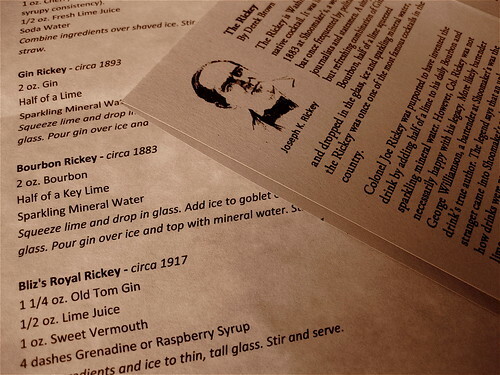 Above all, the nature of the Rickey is to cool you down – it exists precisely to counteract our DC summer weather. Participating in the contest are Gina Chersevani of PS7′s, Chantal Tseng of Tabard Inn, Adam Bernbach of Proof, Dan Searing of Room 11, Clinton Terry of PX, Jayson Smith of PX, Justin Owens of PX, Rico Wisner of Poste Brasserie, David Fritzler of Tryst, Joey Ambrose of W Hotel, J.P. Caceres of Againn, Duane Sylvestre of Bourbon Steak, Laura Secker of Vermillion, Elli Benchimol of Chef Geoff’s (both locations), Amy Troutmiller of Urbana, Joseph David Cleveland of Oyamel, Mike Cherner of Mie N Yu, Milton Hernandez of Bibiana, Rachel Sergi of 701, Jessica Crandall of Bourbon (Glover Park), Theo Rutherford of Ripple Wine Bar, Alex Bookless of the Passenger, Julia Hurst of the Passenger, Alex Nichols of the Passenger, J.P. Fetherston of the Passenger and Columbia Room, and Patrick Owens of Jaleo. Whew! Again, their drinks are available throughout the month for you to sample before August 2. Get your Passport at any of the participating bars and restaurants. Get stamped, cool off, and join in the fun! This post….is making me thirsty! Been making and ordering these since April. When out, I just ask for “gin and soda with lime,” since I’m sure most bartenders would look askance if you asked for a Gin Rickey. I don’t think it would work as well with the sweeter gin, the dryness is crucial to the refreshment. London dry works very well. I just use Gordon’s at home.